Does the private sector deliver care for the poor and other vulnerable people? How do government policies in Ghana shape the role played by the private sector in contributing to national health goals and objectives? 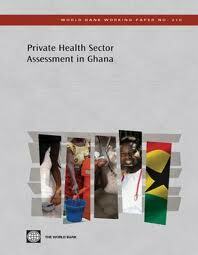 Marty Makinen, a managing director at Results for Development, examined these and related questions in an exhaustive survey of the private sector’s scope, role, and challenges among health providers and patients of all income levels in the home of the Black Stars. The study follows the World Bank Group’s bellwether Doing Business in Africa report (a NextBillion article on the report may be found here), which found that the private sector played a bigger role on that continent than conventional wisdom indicated. Results of Makinen’s 152-page report on Ghana were presented recently to the country’s policy makers; highlights are included in my Q&A with him. Reis: Where do the poor go for health care in Ghana? Makinen: It was a surprise to us that the private, for profit sector is an important source of care for everybody. Many people think those providers only serve the rich in urban areas-and it’s true that the richer do seek care more frequently than the poorer. But we found that everyone across all sectors of the population-rich or poor, living in rural or urban areas-goes for care at public clinics run by Ghana Health Services about 50% of the time, and for-profit, private providers the other 50% of the time, with only a very small percent going to not-for-profits. Reis: Why do people choose to go to the private sector over the public sector, and vice versa? Makinen: On the one hand, patients told us they weren’t sure about the qualifications of people working in the private sector. On the other hand, they waited much, much longer in the public sector-and were treated much, much worse from a customer service point of view. The waiting times we found were about 10-15 minutes in private facilities and one hour or more in public facilities-a stark difference. Nonetheless, 90% of patients going to public clinics said they were happy with [the service] they got! Their expectations may just be low. Reis: The report maps where the private sector is active. Why is this difficult for governments to pinpoint? Makinen: The policy in Ghana states that government will “supervise, visit and gather information, and apply regulation” related to private facilities but their registry of private facilities is not up to date and visits are conducted very infrequently. A provider might register a business in 2002, then go out of business in 2005, but this isn’t recorded. Moreover, government does not have much experience working with the private sector or many resources committed to the cause. Though a policy has been in place since 2003 to engage the private sector, only five people in a department placed at a relatively low level in the hierarchy of the health ministry work on this. Reis: Ghana recently started accrediting private sector facilities as part of its national insurance program. How is this going? Makinen: For-profit providers are very pro-insurance! Insurance is bringing new paying customers-people who couldn’t pay anywhere close to their rates now have a lot of purchasing power. But the private sector had complaints about the national health insurance system. For one, they said [Ghana’s insurance authority] is slow to pay out, and the rates are too low. The other complaint was that the accreditation process has not been fair. Accreditation should be creating fair competition between public and private providers of similar levels of quality. But the health insurance authority gave provisional accreditation to all public facilities without an accreditation process that private providers had to go through and [might]… make this permanent. This negates the purpose of accreditation and tilts the playing field. Reis: Is the private sector opposed to further regulation? Makinen: No overall and not at all for pharmaceuticals. Pharmaceutical groups want more regulation because of fake drugs in the market. People using low quality or fake drugs [wind up] thinking poorly about everyone selling drugs. Reis: Besides a better accreditation process, what else is needed for the private health sector to more effectively serve Ghanaians? Makinen: We learned in another study that we performed that almost all the financing of private, for-profit providers in Ghana comes from doctors, friends and relatives. It’s very informal and very limited. Health entrepreneurs are not business people by training-they are doctors, pharmacists, nurses, or lab technicians. They have learned basic aspects about running businesses but they are not doing serious accounting. They all-too-frequently manage with a “cash in a drawer” approach. They often don’t know how to assess whether to make investments or write a business plan for a bank loan. In addition, Ghanaian banks don’t understand the health sector as well as they might. It should be considered a very stable industry because people are always going to get sick and as incomes rise people tend to consume more health care relative to everything else. Ghana is booming and survey data showed people were going more frequently for care. Few people are out there helping health entrepreneurs make business plans. Local management consultants who work with the general business sector in Ghana could help providers get loans to expand. Reis: How is Ghana’s private sector different than elsewhere in Sub-Saharan Africa? Makinen: The insurance program is now the big difference between Ghana and other countries. In other aspects, though, our results were similar to those found by [studies of the private sector] in Kenya, Mali, and [the Republic of Congo] Brazzaville. Ghana’s private health sector is probably bigger than most other countries in Africa and it’s now much better organized than in other countries. Reis: But in the report you suggest that the private sector should organize itself better. Makinen: Actually, Ghana’s umbrella private sector association was formed at a meeting where we presented our preliminary findings from this study. We pointed out to the group of health stakeholders in the room-government ministers, as well as representatives of key private sector hospital, dental, maternity home and pharmacy associations-that these associations were fragmented but had common interests. They asked if they could use the conference space we rented for the afternoon after the meeting. That day, they decided to associate their respective organizations and they are now the common voice to interact with the government. This will be an important tool for the private sector going forward. Read the full report here and check out other World Bank Group-commissioned private sector assessments on Kenya and Mali.